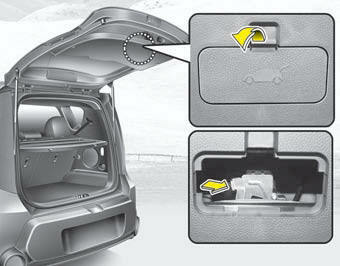 Your vehicle is equipped with an emergency tailgate safety release lever located on the bottom of the tailgate. When someone is inadvertently locked in the cargo area, the tailgate can be opened by pushing the release lever and pushing open the tailgate. For emergencies, be fully aware of the location of the emergency tailgate safety release lever in the vehicle and how to open the tailgate if you are accidentally locked in the cargo area. No one should be allowed to occupy the cargo area of the vehicle at any time. The cargo area is a very dangerous location in the event of a crash. Use the release lever for emergencies only. Use with extreme caution, especially while the vehicle is in motion.